Is Capitalism Past its Sell-by Date? Review of Michael Roberts "The Long Depression"
Review: The Long Depression, Michael Roberts (Haymarket Books, Chicago 2016) 370 pp. Since the bursting of the speculative bubble in 2008, more students have apparently signed up for economic courses than ever before. However, when they get to university many became angry when they find that the courses on offer give them absolutely no clue as to how the real economy functions. We have good news for them. 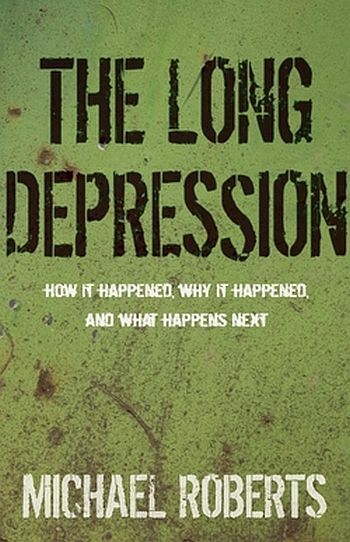 Help is at hand in the form of Michael Roberts’ latest publication “The Long Depression” with its subtitle “How it happened, why it happened and what happens next”. Although theoretically well-prepared, Roberts is no mere academic in an ivory tower. After working as an economist in the City of London for thirty years Roberts published “The Great Recession – The Marxist View” in 2009 and the current book can be seen as the sequel. It is lucidly written in a generous and genial but rigorous style which makes for a lively contribution to the “dismal science”. As one of the most energetic Marxist bloggers on the world economy, Michael Roberts has been doing a running commentary on capitalism’s crises for a number of years [see thenextrecession.wordpress.com]. The 2008 collapse came as no surprise to us. We had been predicting it since the 1990s. Our problem was a different one – we were trying to explain to each other how the speculative bubble was lasting so long into the Twenty-first Century. However when it did eventually burst it changed the discourse of everyday life. “Capitalism” and “the working class” (which were assured had once again disappeared) were suddenly everyday topics of discussion. It also inspired a renewed interest in Marxism and in particular Marxist economic theory. With capitalist (“mainstream”) economists having completely failed to see that they were in a speculative bubble this was not surprising. Roberts does a wonderful job of revealing the complacency of the mainstream economists and also dismantles the various solutions (Keynesian, monetarist etc) that they are now putting forward to get out of the current depression. We’ll leave the reader to enjoy those themselves as we want to concentrate on Roberts’ contribution to Marxist theory. But at its heart this brings a contradiction which is that increased productivity means that labour, the source of all new value, has to be expelled from the production process and thus, as time goes on, there is “a reduction in the amount of labor available for exploitation per unit of capital outlay” [p.16]. The organic composition of capital (the ratio of fixed or constant capital to living or variable capital i.e. labour) rises and thus the rate of profit has a tendency to fall. The tendency can be arrested by many factors but not halted, and culminates in periodic recessions which characterise the capitalist mode of production from day one. The law of the tendency for the rate of profit to fall has not been without its opponents, and not just amongst capitalists. Roberts lists them from German Social Democracy (Kautsky and Luxemburg among them, through the Bolsheviks who did not reject it but never made it central to their analysis) to more modern theorists such as Sweezy (underconsumptionism) and Michael Heinrich. Roberts does not refute them here (merely pointing to the work of Andrew Kliman, who does). The CWO has done battle with some of these in the past. What is striking for the CWO, and the ICT, is that the analysis we have maintained since our foundation (40 years for both the CWO, and our Italian sister group, the Internationalist Communist Party) now finds an echo in the work of others. Roberts confirms that his own researches have led him to see it as central not only to explaining the current crisis but to understanding others going back to the nineteenth century. He finds it the most convincing explanation of why capitalism has periodic crises and considers it will continue to dominate capitalist accumulation until the working class consciously puts an end to it. He is not alone today. Many others, like his sometime collaborator Guglielmo Carchedi, plus Andrew Kliman and Paul Mattick jr etc have all followed a similar line of enquiry. Using this method he also recognises that what happened in the past is no sure guide to the future, but “aggregated evidence over time is much better than ignoring history”. And what he tries to do in this book is combine theory with data, not only to work out what is going on now but where we are all heading. Even if you don’t accept his method or conclusions, his indefatigable research is worth reading in its own right. In a brief review we cannot do justice to the breadth and depth of Roberts’ survey but to give a quick overview, the first seven chapters not only explain how the present recession came about but locate it in the historical context of past recessions and identify three recessions which plunged into depressions. We’ll look at the distinction later, but just to complete the overview, the next four chapters are case studies of the USA, Europe, Japan and the rest of the world to demonstrate that not only did capitalist economists not see the 2008 crash coming but they have still not come up with a strategy for getting out of the current “long depression”. Typically these chapters are full of statistical demonstrations which add up to a powerful case. The book then concludes with two more chapters which show how capitalism may escape this crisis but another one will inevitably follow and that this suggests that at some point capitalism will be superseded by a consciously organised society where those who create the world’s wealth, the working class, will replace production for profit with production to satisfy human need in a sustainable economy. There are two must-read appendices on “Measuring the Rate of Profit” and “The Failure of Keynesianism. So much for the bones, but the meat of Roberts’ message is that the major economies of the world are in a “long depression” and the current low level of profitability, investment and high (and increasing debt) mean that it will not escape it before there is another slump. . A depression is different to a slump, or recession, which occur more frequently – and in Roberts’ analysis approximately every ten years – though each slump or recession exhibits slightly different characteristics and different degrees of contraction. Depressions occur less frequently when a slump is a great deal deeper and of longer duration. Basing himself on the Russian economist Kondratiev, Roberts identifies three such “long depressions” in the last 150 years. These were the depression of the late 19th century (1873-1890s); the Great Depression of the 1930s (1929-1942) and the present one which began in 2008. For him these are points when various cycles (calculated on different factors in the capitalist economy such as renewal time for constant capital or infrastructure or property prices as well as the original business cycle identified by Marx) come together so that what should have been a relatively short-lived recession or slump becomes a full scale depression. Kondratiev (writing in 1925) thought that these cycles came about between 50-70 years and were driven by the movement in world trade in prices of production and commodities. He takes the story back to 1790 to identify three such waves that occurred in the nineteenth century. This theory has come in for much criticism over the years but is currently enjoying a renaissance amongst those looking for a pattern in economic cycles. Roberts admits that his use of the “conjunction” of cycles is the most controversial aspect of his explanation for depressions. There can be little argument with the notion of cycles in the capitalist economy since booms and slumps are a regular phenomenon of its history. It takes no special science to detect them. Those of us who recognise that the law of value, and its peculiar capitalist expression in the law of the tendency for the rate of profit to fall, have no quibble with the notion that cycles are absolutely central to explaining the contradictions of the capitalist economy. Roberts has an interesting discussion (using the Marx-Engels correspondence) to show that Marx believed that if he could only get sufficient data he could accurately work out when the next cycle would end. Marx was only trying to explain what used to be called the business cycle (calculated on the basis of the overall movement of the capitalist economy in investment, employment and output but not necessarily on profitability although Marx thought the latter must lie behind it). Economists now call this the Juglar cycle. However when Marx was writing Capital the business cycle was the cycle of crisis. Throughout the nineteenth century crises burst out in the system for no apparent reason. Whereas all economic crises in past societies were to do with famines or shortages, in the nineteenth century capitalism produced a society which periodically fell into crisis when it was still dynamically growing. It was Marx’s achievement to discover the secret of both the staggering growth and the cycle of collapse in the law of the tendency of the rate of profit to fall. Roberts wants us to see this as comparable with the depression of our day. As an overarching explanation it is powerfully true but it does not ask why the decennial crises of the first 70 years of the nineteenth century give way to this new type of depression. Could it be that the process of centralisation and concentration of capital, which Marx also indentifies as a consequence of the law of the tendency of the rate of profit to fall, had created such a concentration of capital that a brief period of “deleveraging” and devaluation of capital was insufficient to bring about a real shift in the organic composition of capital? Roberts lucidly demonstrates that the main loser in the post-depression period was Great Britain, as most new investment went to the developing German and US economies. Both would overtake Britain before the First World War. As Britain’s share of the world market in manufacturing goods declined relatively even British investors sent their money abroad to its overseas empire. Roberts doesn’t deal with the fact that after the long recession “invisible earnings” (i.e. financial profits made overseas) overtook manufacturing as the main source of national income. Nor does he draw any conclusions about the fact that the long depression signalled that capitalism had moved from just a world market to what Bukharin called a “world economy”. The rise of finance capital and the “Scramble for Africa” were only the more obvious manifestations that capitalism was changing. Imperialist rivalry and the increasing intertwining of the interests of the capitalist class with the state were to have a profound effect on the nature of capitalism. Engels was not the only one writing at the end of the long depression that there would be a European-wide war within twenty years. In the event that war would transform the relationship between capitalism and the state in a way that Marx and Engels could not have foreseen. The fundamental laws of capitalism were not altered, and remain as Marx analysed them, but there was a constant increase in state involvement in economic decision-making which culminated in today’s micro-managing of fiscal and financial policy of today. This state intervention has prolonged, but not solved, the fundamental problem behind the present crisis which requires massive capital devaluation. His lack of curiosity about government action is one of the weaker aspects of his excellent work. For this is key to how capitalism has endured in the post-Second World War period. The relationship between capital and the state began to change just before, but more particularly, after the First World War in line with the imperialist character of late capitalism. Before the First World War the state accounted for approximately 10% of GDP but after it there is a broad tendency for the state to take on more and more the role of generating GDP. In the UK, for example, it rose to over 40% after 1945 and, despite all the talk of “rolling back the frontiers of the state” in the 1980s, that figure has not altered much. The issue is quite complex but without such state intervention and micro-management via interest rates and fiscal policy the capitalist crises would be far more intense and socially destructive than they have been so far. In our analysis there certainly are cycles but the business cycle of the nineteenth century that Marx tried to calculate has been transformed into a cycle of booms and busts culminating in a generalised war. Only massive wars involving the leading capitalist nations can devalue the necessary amount of capital and open up a new cycle of capital accumulation. Roberts recognises that the Second World War did just that in his chapter on the Thirties Great Depression. Who can disagree with his central conclusion? Yet he doesn’t see war as playing a distinct part in devaluation beyond all the other strictly economic means (bankruptcies, write-offs etc). Is it a coincidence that the greatest secular boom in capitalist history came after the most destructive war in history? This post-war boom came to an end due to the crisis of profitability in the early 1970s and a succession of policies have been tried from Keynesianism (spending your way out of a depression) to neo-liberal deregulation in order to allow capital to move more freely to find cheaper labour. All ultimately failed and culminated in the false dawn of the speculative bubble, fuelled by debt, which came to a sudden halt in 2008. And the state was on hand to bail out the banks and transfer private debt into sovereign debt, leaving the biggest legacy of indebtedness since the Second World War. The difference is that today the state, instead of allowing a devaluation such as that of the world in 1945 (since the collapse of the banking sector would have put the system at risk), has just kicked the can down the road. The issue of devaluation, as Michael Roberts and many others have made clear, still hangs over the system, preventing growth and ensuring the debt mountain gets ever higher. He expects though that capitalism will escape once again. What we cannot see is just how a peaceable devaluation can come about as long as states everywhere are determined to defend their own capital values in a world where rising levels of frustration with the failing system are (in the short term) benefitting beggar-my-neighbours policies, such as competitive devaluations and tariffs (world trade is falling as we write) and causes for more general war are proliferating all over the planet. Yet Roberts does not see generalised war as related to the economic cycle. In his concluding remarks you can see that he regards war as something unconnected (“exogenous” as he might say) to the process of accumulation. Our argument is that another slump will only have the same sort of effect as 2008 but there will even more dire social consequences. Even after another slump capitalism, with the added oxygen of state management (although it is running out of options), might be able to limp along economically for some time yet. Even so, without tackling the overblown organic composition of capital via the devaluation that only a major war can bring, it can only do so at the expense of the working and living standards of most of the world’s population. Social convulsions cannot be avoided. Whether these result in the victory of a class conscious working class creating a new mode of production, or “the common ruin of the contending classes”, possibly via an imperialist conflagration (think of Syria multiplied) is a matter for history to decide. In the meantime, despite our different perspectives, we would encourage every revolutionary, who wants to see how Marx’s economic constructs can explain what underlies the capitalist economy today, to go out and get Michael Roberts’ latest book. Without an understanding of the material basis of modern capitalism we can have no meaningful discussion about where we are headed, and what the challenges are that lie ahead. “The Long Depression” is an excellent and stimulating contribution to that task. The book is excellently produced by Haymarket Books with only one typo in 370 pages and has an excellent wrap round cover that can be used as a bookmark. The only small mismatch is a UK author writing for an American press means spelling inconsistencies. Where quoted we have used the same as in the book. See for example leftcom.org . Kliman’s debunking of underconsumptionism can be found in Chapter 8 of his “The Failure of Capitalist Production”. Roberts (with Carchedi) replies to Heinrich in “Old and New Misconceptions of Marx’s Law” in Critique 41. After another eighteenth century clergyman Thomas Bayes (1701-61) who, unlike Malthus, was a non-conformist. He discovered a simple formula for calculating probability. His idea was that new data should be used to question existing knowledge or expertise. His happy conclusion [for investors] is that we are in for a repeat and that bond yields and inflation will now rise again. He does admit that this long depression did also lead to a rise in protectionism but does not mention that this, in due course, was also a contributing factor in the drive towards the First World War. We are not sure what he means by “capitalist sector” unless he thinks that socialism is about state ownership of the means of production and that nationalised industries are socialised. This does not seem to be the case as the evidence of the final quote from his book in this review demonstrates. Thank you, Jock, for such an informative review of a modern explanation of the state of capitalism, which I have read through very carefully, inserting extra commas to help grasp the stepping stones of concepts as it unfolded. Could it all be clearly summarised in a leaflet ? I have not yet read this but I have followed his blog for a while. "So let us consider another aspect of the capitalist crisis which does not emphasise the primacy of tendential or actual declining profit rates or the ever mounting difficulty of selling the product of productive forces that expand ‘like gas’. Let us emphasise the class struggle. In the final analysis, this is the determining factor which decides capitalism’s fate. Whether or not capitalism will succeed in dragging us through a long period of mounting social barbarism in a futile attempt to overcome its innate contradictions which produce incremental crisis, environmental devastation, wars, ultimately generalised imperialist war, entirely depends on the capacity of the working class to understand the real nature of the capitalist process sufficiently to put an end to the class antagonism which is capitalism’s essential feature. Marx wrote that the capitalist crisis is the growing incompatibility of the productive forces – prime amongst which is the working class – and the capitalist relations of production. The working class is the productive force constantly at odds with the capitalist profit drive, a drive which now threatens its very survival. The entire trajectory of capitalism is determined by the capacity of the working class to resist capitalist exploitation, and now, to comprehend its real conditions and overthrow capitalism. The capitalist process sets in motion its own gravedigger, a class constantly forced to defend itself through unified struggle from the insatiable profit drive which allows continued expansion without which capitalist enterprise dies." This sounds like maintaining many capitalist categories. Now a socialist answer, rather than a Keynesian one, is that we need governments to take over the major sectors of the economy to produce for social needs rather that for profit. That means controlling the investment and ownership of all the major banks and other big companies. Many more people read of marxism than regard themselves as revolutionaries, as situations vary considerably, even though all under imperialism. What would be required to be revolutionaries in England in 2016 ? Would they be expected to be willing to shoot police and troops guarding strongholds of capitalism and palaces ? Would they have to follow orders from a central command ? If so, who by ? How would workers challenge wrong ones ? Is it rational to call for revolution prior to realistic plans for proletarian economic and political power to be known and seen to be prepared? It is unreasonable to expect workers, already dissatisfied with capitalism, to rise against it before having any clear ideas as to what to expect and do in their localities and wider afield. A world planned socialist economy is no nearer actual plans than a pipe dream. If and when presented, workers will need to know whether or not money will still be need ed by them, as from a definite date. Just as feudalism couldn't just be totally overthrown in one or more fell swoops, nor can capitalism. To apply reason, before you take a step, consider the consequences, not just motivations. Unemployed workers are less likely to want to be known as revolutionaries than those marxists who h ave enough income and time to read and write about it, because workers still need money, and employers will want to know who they are taking on. Optimism and pessimism are no criteria for weighing up the score as at November 2016, Capitalism worldwide will not be overthrown before more war is unleashed, but millions of workers, even if not revolutionaries, can demand world peace, which, paradoxically, would also benefit capitalists. Although, so far, there are no plans for a world socialist economy, workers interested in such a project might consider some of what would probably need to be its components. ICT and CWO and other organisations of the 'communist left' are not alone in trying to foresee an economy which does not use money. To avoid blogging, I will email details of one to CWO now, hoping that this will be useful to ongoing perspectives. You love the economic plan! A massive production/distribution of rice and potatoes, feed everyone at least something in the opening stage. Paid by the social fund, freely available to all. Expansion of education incorporating communist party work. All religious buildings to be converted to educational facilities. Conversion of large supermarkets to warehouses. Small shops etc to be converted into educational facilities. Langage learning to be emphasised in the interest of internationalism. Limitation of working hours to promote equality. Ever greater contribution to social fund for communal projects (health/education/parks/) rather than individual consumption. Obligatory involvement in security and military tasks so long as they are required. This could be a precondition for obtaining work. Sorry, I couldn't resist it! I promise to do some serious CWO work to atone! Despite this clear analysis, the solutions proposed by the platform specifically excluded the obvious: the taking over of the big five banks by the state under democratic accountability to turn them into a public service for households and business and end their speculative adventures. All of which demonstrates that a sound analysis of the failings of capitalism is not enough if not accompanied by a defence of revolutionary politics and the recognition that communism is not just a nice version of capitalism but an entirely new mode of production in which the law of value has been abolished (and one of the first things to go will be rents and mortgages, Stevein!) and society is moneyless. Roberts is not the first economist who has done useful work in defending the Marxist critique of capitalism yet does not link this to a revolutionary political programme. Even today Andrew Kliman has a similar critique of the the system to Roberts and ourselves (using a slightly different calculation) but as a member of the Marxist-Humanist Initiative he is supporting a "lesser evil" vote for Clinton in the US election. The temptation to be drawn onto the agenda set by the bourgeoisie is too great, even for those who should be theoretically armed to oppose it. Both Roberts and Kliman fail to see that the devaluation of capital through war are central to modern capitalism (or the epoch of imperialism as we call it). That was one of the central arguments of the review above. Any mere economic devaluation will not be enough and the next recession will be followed by more stagnation, even another recession but with state help (as now) capitalism might limp on until the pressures (which are rising rapidly now) for either war or revolution become inescapable. I remember at school we used to get vouchers to pay our meals. So you were issued with a whole series of them at the beginning of the week to exchange for food. That idea could work as a labour certificate. Exchange a whole bunch of vouchers in different locations. Climate change is the other great issue. It looks very much like a series of greater slumps and fragile recoveries is too optimistic a scenario. We face revolution or ruin. Not even a long period of barbarism to look forward to. What I see is a lot of poor people, often with kids, living in the basic housing, then a differentiated housing for others. So let the people in basic housing live free. Let the others have to spend some of their voucher/s on the better accommodation. Meanwhile all new housing to be based mainly on communal areas, canteen, launderette, showers etc. This does not require money. I think that a progressive emphasis on the social fund as opposed to individual reward could be a vehicle for moving to the higher stage of distribution not connected to input which I think is the real victory over the law of value. Admittedly this is tentative speculation, the reality will not be predicted outside of generalisation. Looking at all the comments to date, in so far as abolishing money might eventually become the order of the day, it seems to me that there would need to be some alternative way(s) of assessing just how much energy and time will be needed to do each of the many things required by society. The element of surplus value, exploited, would of course no longer apply, but material resources and human efforts need to be efficiently applied for optimum results, which hopefully would also provide time to relax, travel and so on, when the basic requirements of food, shelter etc are met.. Thank you stevein7. I've just logged on to the site you mentioned and had a quick look at some of it. I note that you were permitted to refer to it without being denied per blogging ! Interestingly, chapter 15 of Bukharin's book deals with the phasing out of money. I will admit to being unclear on this matter. The cwo seems to be arguing for immediate abolition of money. Bukharin is talking about a new currency then a gradual elimination of that new currency. I am not saying I definitively know how this will play out in future circumstances. But I am a little skeptical re an immediate elimination of money even if the labour time voucher could be an immediate feature. It seems to me that creating and setting in motion a planned economy will be a huge challenge, it will take time. Trade with the remaining nonsocialist world? With money? We do not wear rose colured spectacles, there is no definite evidence that the whole globe will fall to revolution like a series of dominoes, nor do we know that will not be the case. Following what you said on 2016-11-13, it seems necessary and worthwhile to reconsider the argument that the working class can gain ground step by step, yes, that means nation by nation, following Lenin's view that that is the only and best route towards world socialism. The notion that working class revolutions in those steps wouldn't need working class states is mistaken, in that proletarian power will need to be enforced, against the lingering tactics of bourgeois elements, using proletarian police and armed forces on a no-nonsense basis for as long as it takes to get things clear. Remnants of gross parasitism can be directed to corrective labour on wildlife projects, closely supervised by red guards. They will come to appreciate the difference between dinner parties and food banks. I am very wary of absolute statements. The transition to socialism will not be accurately mapped out in advance. Choppa, there is much in your analysis I like. There were various reasons for the welfare state and affordibility was a factor. Postwar another round of accumulation with healthy profit rates could occur. A future proletarian threat will not be bought off by a capitalism gasping for profit. But I was disappointed by the inability to recognise Stalinism as a capitalist variant, as I am by MR ‘s prescriptions for virtuous banks serving the people and other measures falling short of the smashing of the capitalist state and the rule of the workers’ councils, despite an excellent analysis of capitalism’s crisis mechanism based on the tendential falling profit rate and defense of Marx in that regard. I must stop commenting on CWO articles, because I must grapple daily with survival from age 80.5 onwards, whilst the proletariat will do whatever it thinks appropriate.